SHOULD THE MARATHON CONTINUE AS A MEDAL SPORT? 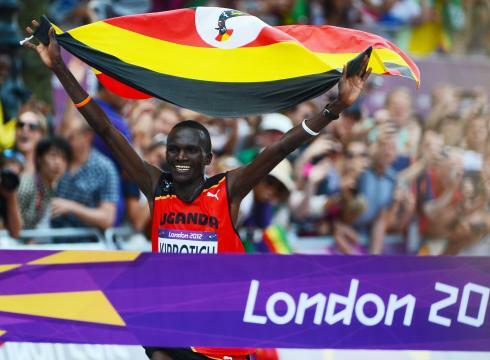 Uganda’s Stephen Kiprotich shocked himself, his nation, and the marathon world with his gold medal run at this year’s London Games. His win over the superstar Kenyan team — two of whom, Abel Kirui and Wilson Kipsang, took home the minor medals — and the inexperienced Ethiopian squad — all three of whom dropped out — made Uganda the 17th nation to have produced an Olympic Men’s Marathon champion since the Marathon was first introduced at inaugural modern Games in Athens 1896. Though trained in Kenya, and from the larger Kalenjin community of nilotic ethnic speakers residing in Uganda, Kenya and Tanzania — thus Stephen shares the Kiprotich surname with Kenya’s bronze medalist Wilson Kipsang Kiprotich — the surprising Ugandan victory also continued Kenya’s own Olympic Marathon frustrations. While Ethiopia leads all nations with four Olympic Men’s Marathon titles, to date, only the late Sammy Wanjiru has mined gold for Kenya, that in Beijing 2008. Notwithstanding the anomalous Kenyan Olympic performances again manifest in London, the nation’s overall dominance of the sport paced on unabated. In 2011 Kenyan runners commanded the marathon like never before, notching the top 20 official times of the year, taking the top two spots at the World Championships, while representing 65 of the fastest 100 performances. Now, as we complete the 2012 calendar we can see that their traditional East African rivals from Ethiopia returned fire these past 12 months, placing seven in the year’s top 10 performances — though Kenyans Geoffrey Mutai and Dennis Kimetto held down the top two places (2:04:15 & 2:04:16) from their pas-des-deux in Berlin. A deeper dive into the 2012 marathon stats shows that the two East African juggernauts combined for 89% of the year’s fastest marathons, Kenya with 58, Ethiopia with 31. In comparison the fastest American of the year, Dathan Ritzenhein, languished back in 69th position off his 2:07:47, ninth-place finish in Chicago in October, yet still making him the fourth fastest American in history. Meb Keflezighi’s Olympic Trials victory in Houston in January, a PR of 2:09:08, pushed him to # 128 for the year, while Ryan Hall’s 2:09:30 in Houston nestled him back into 154th position world-wide. The top non-African born runner on the list was Poland’s Henryk Szost in position 59 off his 2:07:39 second-place finish in Otsu, Japan in March. According to the IOC, a sport or discipline may be included in the Olympic program if the IOC determines that “it is widely practiced around the world, that is, the number of countries and continents that regularly compete in a given sport is the indicator of the sport’s prevalence”. With millions of marathon finishers across the globe, there is no doubt the marathon is widely practiced. What is in doubt is whether that practice is at all competitive anymore. Therefore, with tongue ever so gently in cheek, I wonder whether the marathon deserves its inclusion on the Olympic calendar in ensuing years, or should it be consigned to the non-medal “Demonstration” category, notwithstanding the Kenyan futility. After all, the Olympics has a long history of adding and subtracting sports. “Discontinued sports” is the official term for the dispossessed, and the reasons for their removal have been either because of lack of interest or absence of an appropriate governing body. Golf was included in early Games, 1900 and 1904, then dropped by the IOC. But it is again scheduled for the Olympic medal program in Rio 2016. Other sports like archery and tennis have suffered similar Icarus-like falls and Phoenix-like resurrections. In recent times, the case of baseball is most intriguing. A demonstration sport at the 1984 Los Angeles Games and again in Seoul 1988, baseball became a medal sport in 1992 in Barcelona. There, Cuba won the gold, then repeated in the Atlanta 1996, defeating Japan in the final. Until that point, only amateurs participated in Olympic baseball. Professionals were first included in Sydney 2000. But though allowed, Major League Baseball, itself, wouldn’t permit players on its 40-man major league rosters to go. Notwithstanding, the U.S. team won the gold in Sydney, but then failed to even qualify for the Athens Games four years later. And though Cuba won three of the four baseball gold medals, international sports officials deemed the game “too American” as the reason for its removal. But underlying that fare-thee-well was an undertow of pique that Major League Baseball wouldn’t suspend its season –- as the NHL did for the Winter Games — so the top professional could represent their nations, a complete about face from the Chariot’s of Fire era of strict amateurism. But if baseball is “too American”, what can we say about the Marathon? Clouded in ancient myth, then born at the inaugural modern Games of Athens 1896, the first Olympic marathon was won by a Greek farmer Spyridon Louis. Out of that grand experiment was born the Boston Marathon the following spring, and thus the sport took root and grew. Over its 28 Olympiads the marathon has seen 17 different nations win gold medals. Sounds pretty widely practiced to me. But the Olympic Marathon is the exception which may well prove the rule. Yes, millions participate in the recreation of marathoning around the world, but is that what’s meant by the Olympic standard, “it is widely practiced around the world, that is, the number of countries and continents that regularly compete in a given sport is the indicator of the sport’s prevalence”? When two nations so totally dominate a sport year-in and year-out, how prevalent is it anymore in the sporting sense? Outside of Kenya and Ethiopia, only nine other nations have runners with times in the top 100 for 2012, and of those nine, only Morocco has more than one (with two). (Oops, Japan also had two, Arata Fujiwara at No. 70 with his 2:07:48 second place in Tokyo last February, and Hiroyuki Horibata, No. 95 with a 2:08:24 runner-up position in Fukuoka in December. Thanks to stats maven supreme Ken Nakamura for the correction). In any case, such historically potent marathon nations as Spain, Portugal, Mexico, Italy, The Netherlands, Australia, New Zealand, South Africa, and England or nowhere to be seen. Move to the second 100 best times of 2012 (101 – 200), and only South Africa, The Netherlands, and Italy add on to the list not already included in the top 100. Well, Qatar is listed once, but that’s just another Kenyan running for Qatar. Meaning only 12 nations other than Kenya and Ethiopia are in the top 200 worldwide! Of course, I’m not serious about eliminating the Marathon from its iconic place among the Olympic presentations. But the stats, as always, are telling. Well, might as well drop the steeple too. I like what you’re trying to do here. It’s clear that the East Africans dominate. I like the baseball analogy but I also agree with the other comments; baseball truly is culturally American. The only reason Cuba has that tradition is because it was firmly nestled within the American sphere of influence for close to a hundred years. Running is universal. Humans – by virtue of being bipedals – will always be running. Some, however, will be running faster than others. It is a problem that the sport of marathon running is so dominated by one group of people. It makes it less exciting for fans and reduces its ability to be appreciated globally. This seems to be a tough cycle to break though. The Kenyans are genuinely fast and their is serious economic incentive for them to be fast. We don’t have that in the west. Unless the financial incentives come, the best runners will be coming from running offers the best chance to get ahead. I know your tone wasn’t serious, but eliminating the marathon from the Olympics isn’t a solution. Why punish the Kenyans for being the best? Shame on the rest of the world. Perhaps the best way to increase potential earnings for professional runners outside of Africa is by making those hordes of hobby joggers, whom you referenced in your post, interested in the elite part of the sport. The potential is there for this market to support the best of the best. Phenoms like Ryan Hall who are marketable can help elevate running in the west. Regular people are running a lot more these days, now we just need to make them interested in the folks who do it at the highest level. Must’ve been a slow day @ the Reavis compound. The marathon is many, many times more pervasive (practiced) around the world than baseball. I say leave things the way they are; there are other instances where certain country’s dominate Oly sports for lack of groomed, strong programs in other places.